I am not a victim you are just a prick learn the difference you moron. What was that about civility? I am done with civility. I have been doing it for about a year now, taking your crap and just being a good guy, not stooping to your level, but honestly whats the point. You guys really are a bunch of D!cks. I have admitted the Article was wrong. I strive to be as civil as possible in my thread, try where possible to make light of things but honestly, what a bunchy of pricks you lot really are, this is what you do to feel superior, gang up on some random online and pat each other on the back like you have achieved something. Its pathetic get a life. Am done with this thread for now. Yes, they are dicks, but you have to understand why they are being this way. Trump supporters are in a very bad position and they have to latch-on to every little small thing they can in order to continue to justify their illogical delusions. You just happen to be caught in the middle of this one. Wait I thought you were impartial and waiting for the investigation to end before drawing conclusions. Yet now you know trump supporters are delusional. I thought you'd gone for a beer - probably a good idea at this stage as your abuse of others as a defence mechanism to shield your embarrassment is really rather ugly. You are a disgrace to the flag. Whoring yourself out to the Trump lovers for a few extra starts. This thread didn't go so well for you, eh? You now admit the "article" is wrong, but you have still not admitted YOU were wrong, which is essentially the continued point here. I only provided a link to another news outlet who sourced ABC. That does not make me wrong, it makes ABC wrong something I have admitted to. How can I possibly be wrong for ABCs poor reporting? As long as it's everyone else fault....right? Correct me if I'm wrong, but wasn't the OP based on this exact premise? In fact, aren't most left arguments? Tell you more about what? 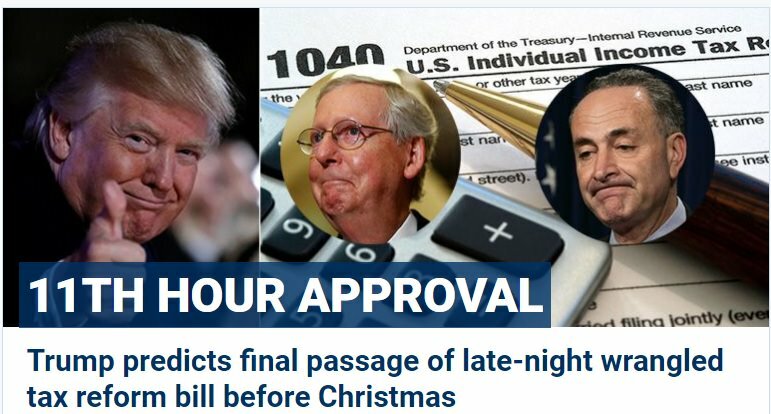 Trump finally got something passed, even though it appears that the deficit-minded Republicans were very concerned about the plan.